Welcome to Specialist Services Limited, a division of Connection Couriers and one of the largest independent networks offering a collection and delivery service of Dangerous Goods. 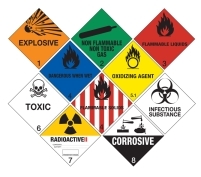 There are nine classes of hazardous goods and Connection Couriers is qualified and approved to transport all dangerous goods, including Class 1 Explosives and Class 7 Radioactive material. In addition to our exceptional Dangerous Goods Transport Service we also offer one of the industry's leading ADR Training services.